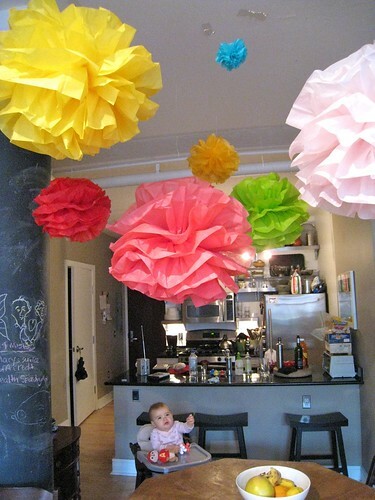 I totally went overboard with the tissue paper pom-poms for Lucy’s first birthday party. As you know, I love paper (especially tissue paper) and folding. I have seen this Martha Stewart craft all over the internet and thought why not. It was the most satisfying craft project I have made in a while. About 60% of the tissue was salvaged from old gifts. Quite a few of the sheets had tears in them from tape. And I only cut the edges on the first one I made. This is such a forgiving and easy project. Seriously, Martha added directions to make the project look a little longer than it really is. Skip the ruler and get to folding. Folded eight sheets of tissue paper in an accordion fold. You should have the paper stacked in front of you in portrait position, tall and skinny. Fold up the paper. Then wrap a long, skinny wire around the center of the paper. Once you are ready to puff the paper, just begin peeling away each side like an onion. 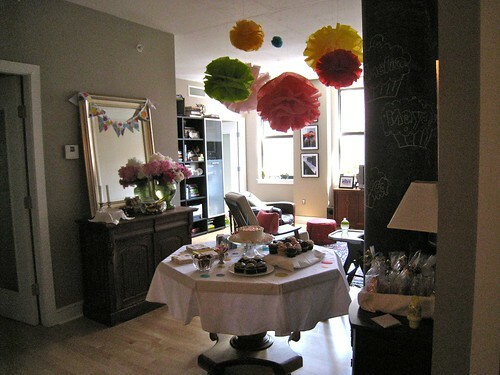 I wanted to have a collection of bright colors for my loose polka-dot birthday theme. So I opted for different sizes. The quantity of the paper generally determined the size. 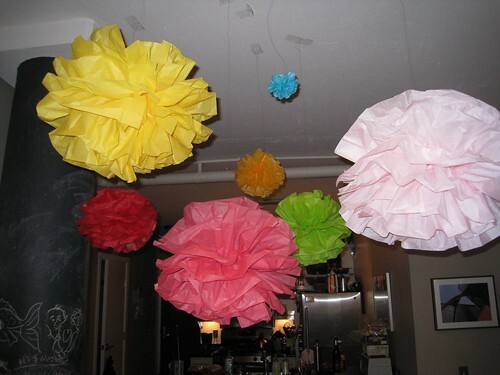 If I only had four sheets of paper, then I would fold it in half and make a half size ball. For the teal, I only had one full sheet, which turned into a little baby. I did try to stick to the 2×3 ratio. So 20″ x 30″, 10″ x 15″ or 4″ x 6″. But I didn’t on the red one, so this is not a crucial element. It probably just helps you to achieve a more symmetrical result. But it is super easy if you have a fresh pack of tissue paper, which coincidentally comes in eight sheets. Little straightening is necessary. I was lucky to have a couple of fresh packs of Paper Source tissue paper. I may have to go back and buy up a rainbow of colors. Again. I feel some presents coming out of these. Lucy knew it was a special day when she woke up on Friday. 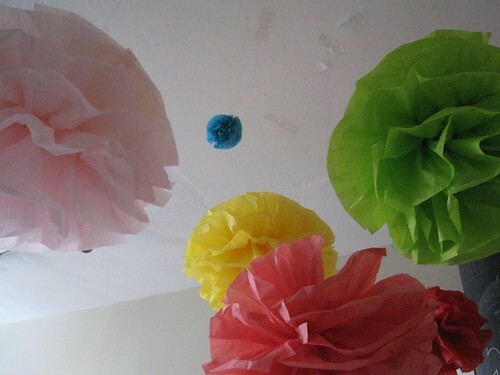 It’s time to clean out those stacks of used tissue paper under your bed that you couldn’t bear to throw away! Now how do I get the tape off of my ceiling? Everything looks great! Happy Birthday Lucy! .-= Corey´s last blog ..Black and White Wednesday =-.